Creating color charts (on canvas panel or gesso board) with the basic oil colors can help you practice and see the fundamental nuance and richness of paint. Much better than buying a large assortment of colors – you can create them yourself. 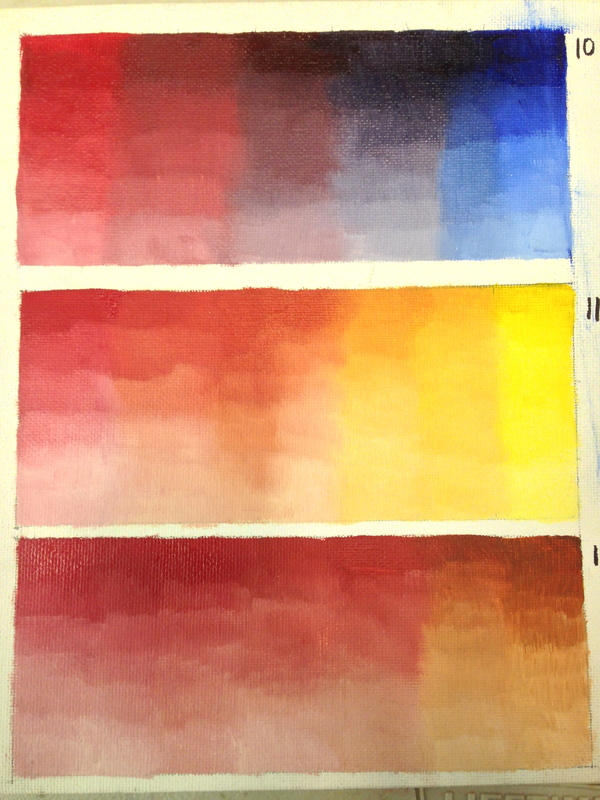 The colors you will need for the following charts are what I have my students use – an adapted Reilly palette. Ultramarine blue, cobalt blue, cadmium red deep, alizarin crimson, cadmium yellow light, burnt sienna, ivory black, titanium white. 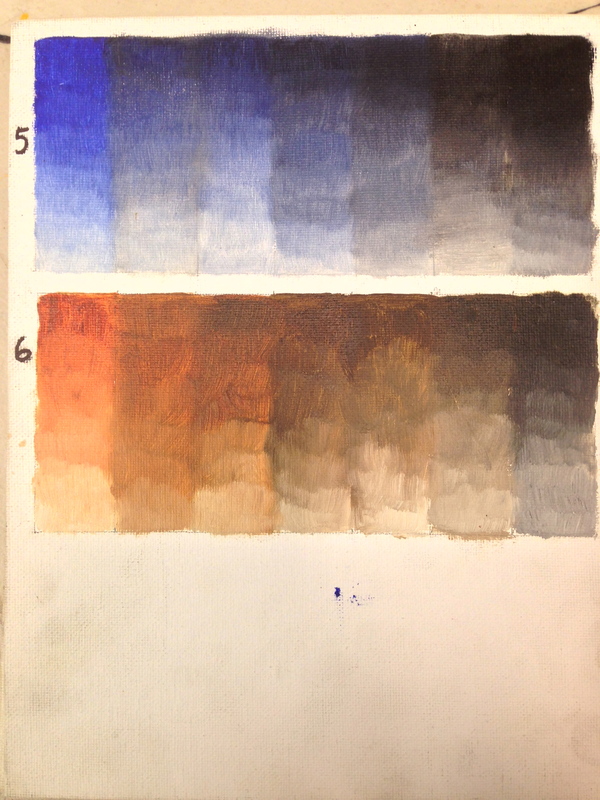 Ultramarine blue + burnt sienna (top). Ivory black to white (bottom). 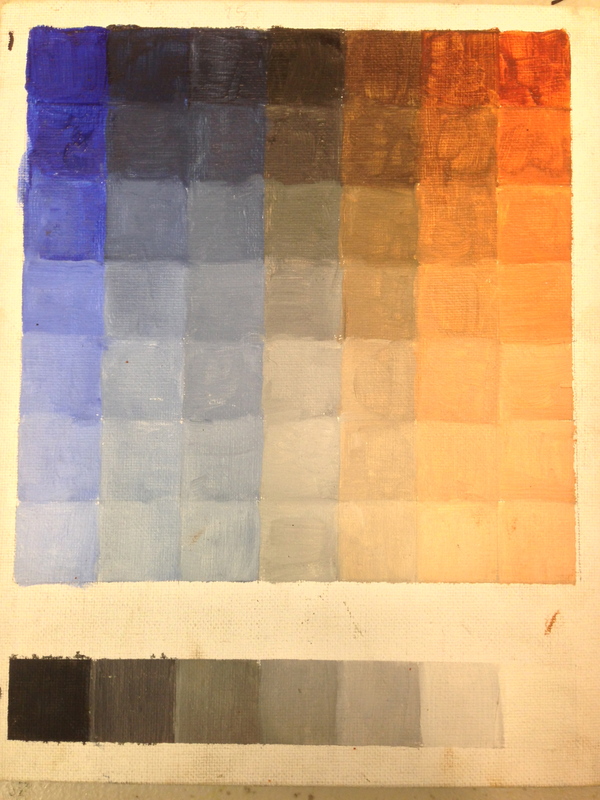 Chart #1 (above): (7 x 7″ using ultramarine blue and burnt sienna) is the first chart my students use, to prepare for their first four tonal paintings using the classical method. There are 7 rows, showing the pure colors on either side, plus the gradual addition of white to lighten value. The center row mixes 50/50 of each pure color at the top, then add white gradually toward the bottom. Each row on either side of the center row has 75%/25% proportion of color, favoring either the blue if on the blue side, the sienna if on the sienna side. The second to last row on either end is 90%/10%, same favoring. When you are finished, you should have the top row from the left to right show a gradual change from cool to warm – the center row will be almost gray looking. This happens because the colors are complementary, and are neutralizing themselves. Chart #2 (bottom gray scale above):At the bottom of this panel we make a value range with just pure ivory black on the left, titanium white on the right, with the gradual stepped progression in between. Cadmium yellow light/burnt sienna; cad yellow/ultramarine blue; cad yellow/ ivory black. Charts # 3, 4, 5 above, from top to bottom. Using the same method with keeping the top horizontal and left/right vertical rows pure, we combine proportions. In this case, we mix the subsequent additions of white more gradually, instead of square by square. 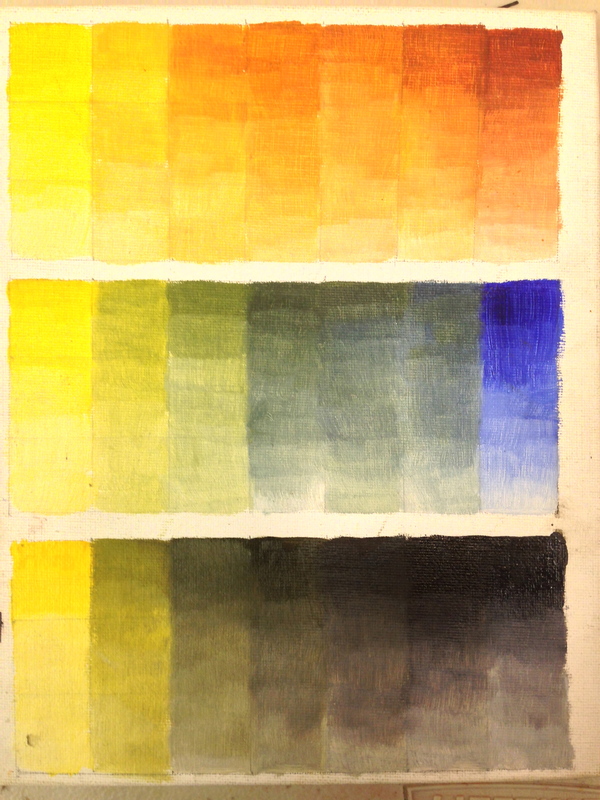 Top/Chart 3: Cad yellow and burnt sienna; middle/chart 4: cad yellow and ultramarine blue; bottom/chart 5: cadmium yellow and ivory black. Ultramarine blue/Ivory black; burnt sienna/ivory black. In above charts # 5 and 6, create beautiful cool and warm grays using the same procedure. Cobalt/ultramarine blue; cobalt/cad yellow light; cobalt/burnt sienna. 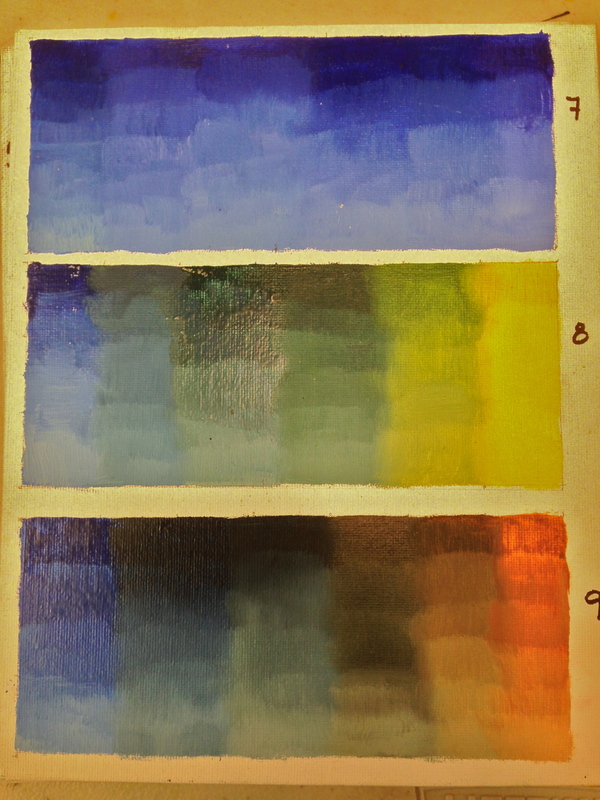 These charts above (7, 8, 9) use cobalt blue, a blue that appears and mixes differently than ultramarine. It is more opaque and bright. We mix it top with ultramarine, then the middle chart it is mixed with cad yellow light, and the bottom chart with burnt sienna. Again, the top horizontal rows are pure, with gradual additions of white. The middle vertical rows are about 50/50%. Outside rows that are vertical are also just the one color, with the addition of white. Notice how different the greens are. 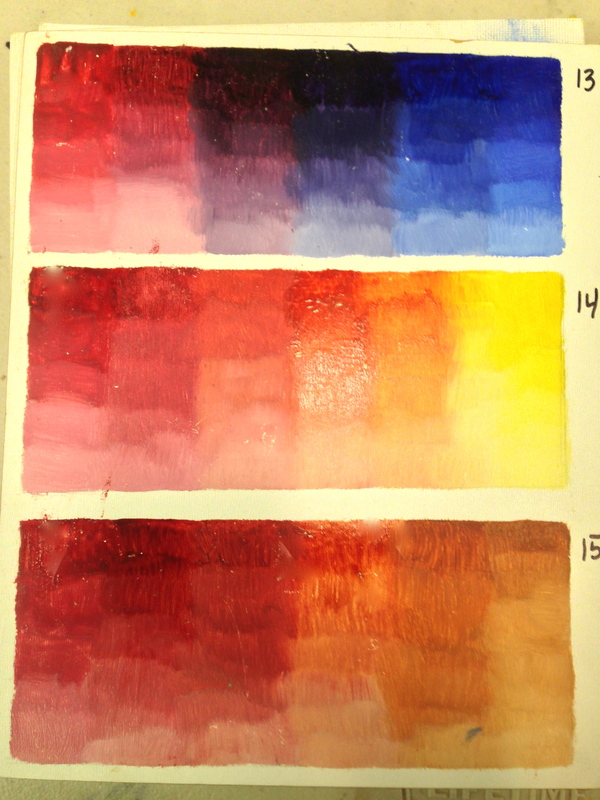 Cadmium red deep/ultramarine; cad red deep/cad yellow light; ad red/burnt sienna. Next, we bring in the cadmium red, to mix with our colors, and see how different the violets, oranges and earthy reds can be. Same method as above. Alizarin crimson/ultramarine blue; alizarin/cad yellow light; alizarin/burnt sienna. Same method, only we use alizarin crimson instead of cad red deep. This is going to give you a much cooler version of the violets, oranges and earthy reds. With these basic colors, you could be well on your way to having a full and rich palette. Not covered here is using burnt umber, which could be mixed with all of the above colors in the same way, giving you more variety, umber being a cooler and greener dark value. Have fun experimenting and playing with these charts – it will really benefit your painting – and give you the needed practice in mixing color and seeing values in mixes. Such a wonderful combination of the color wheel. What is your favorite art media, oil? Hi Seg, thank you, and yes, my favorite medium is indeed oil!